There’s an old axiom that mediocre books make great movies and great books make for lousy movies. Mario Puzo’s bestseller The Godfather is a straightforward potboiler but Francis Ford Coppola spun it into one of the best films ever made. In contrast, F. Scott Fitzgerald’s The Great Gatsby has beguiled multiple ambitious, misguided filmmakers into making cinematic duds. 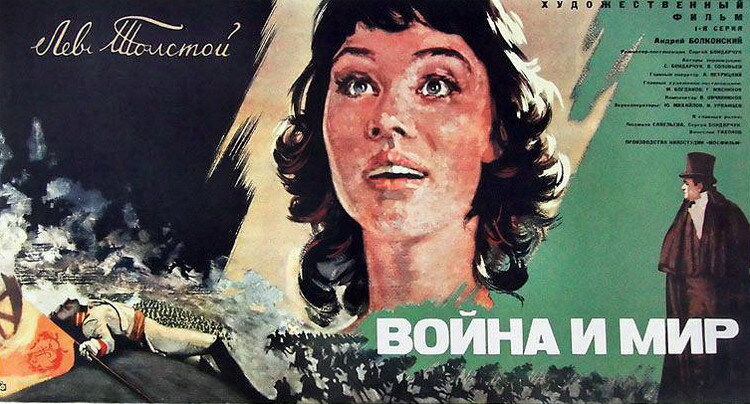 The Soviet government marshaled a staggering amount of effort and expense to realize this film. Never underestimate the will of a totalitarian dictatorship with an axe to grind. Production started in 1961 and lasted six years. More than forty different museums contributed costumes and set dressing to the production, including things like chandeliers, silverware and furniture. The Department of Agriculture contributed 900 horses. The Red Army had 12,000 troops play as extras during the climactic Battle of Borodino sequence. Bondarchuk suffered two near-fatal heart attacks during production. “War and Peace” is the definitive epic of all time. It is hard to imagine that circumstances will ever again combine to make a more spectacular, expensive, and — yes — splendid movie. Perhaps that’s just as well; epics seem to be going out of favor, replaced instead by smaller, more personal films. Perhaps this greatest of the epics will be one of the last, bringing the epic form to its ultimate statement and at the same time supplying the epitaph. You can watch a small section of the film above. But to watch the complete film online, in better resolution, click these links: Part 1, Part 2, Part 3 and Part 4. Or watch them all in this playlist. (The film lives now on Youtube thanks to Mosfilm, the great Russian film studio.) And if you need subtitles, click CC at the bottom of the videos. Bondarchuk's War and Peace, which you can also purchase online, is listed in our collection, 1,150 Free Movies Online: Great Classics, Indies, Noir, Westerns, etc..
Jonathan Crow is a Los Angeles-based writer and filmmaker whose work has appeared in Yahoo!, The Hollywood Reporter, and other publications. You can follow him at @jonccrow. And check out his blog Veeptopus, featuring pictures of vice presidents with octopuses on their heads. The Veeptopus store is here. seulement. il voulais que on s’accroche les uns au autres pour connaitre la valeur de notre vie sur terre et prendre soins des deux et toute est possible et quand en veut on peut et ce n’est jamais la guerre qui ressouderas nos problèmes ces bien la pais en utilisent l’amoure et la conscience et on doit ce dire comment les gens prendraient t’ils notre mort quelle seras notre réputation quoique nous soyons musellements c retiens ou bien juives hommes ou femmes riches ou pauvres même chose pour la différence de couleurs la perfection est impossibles mais en peut toujours essayer et il ya toujours de l’espoir quand en veut bien faire et comme il se dit le hasard fait bien des choses il suffis que nous ayons tous un bon grand ceaur.